Oven roasting creates certain flavours and aromas in vegetables that you’d never achieve with other cooking techniques like blanching or sautéing. Sometimes it just adds a little finesse to the root, cabbage or squash’s own qualities, but in some cases it puts the whole experience on another level. Aubergines are a great example. To me, they show their most delicious side when brushed with olive oil, sprinkled with sea salt and crushed black pepper before they reveal their whole impact under the grill. The exceptional taste of a slice of perfectly grilled aubergine is the best that can happen to this fruit, in my eyes! 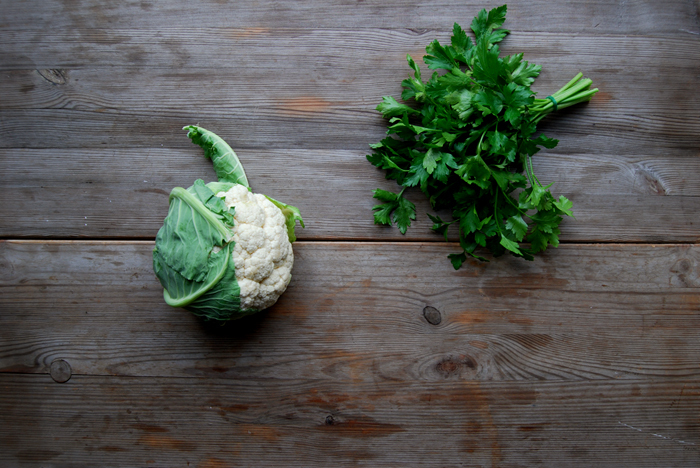 A few days ago, I wrote about my low enthusiasm for cabbage this winter, I’m just not in the mood, but still, I had to buy this little head of cauliflower cuteness when I saw it at the market. Sometimes you just need to the see and smell the food on your plate to wake up the taste buds. Oven roasting came to mind and seemed like the right approach to deal with this pretty vegetable. 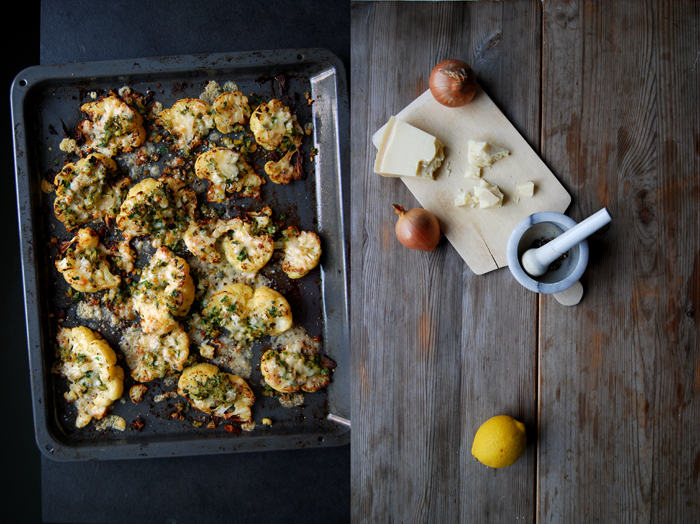 I remembered my baked fennel with homemade sausage I wrote about a year ago, I topped the blanched bulbs with a crust of fried onions, garlic, parsley and parmesan and roasted them under the oven. 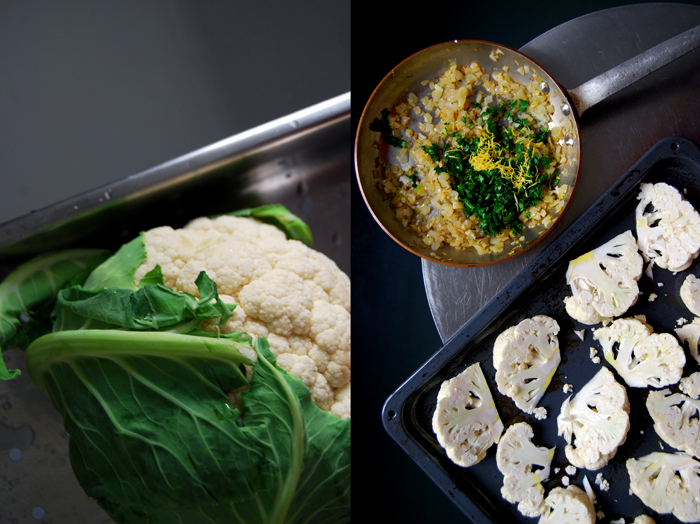 I prepared my cauliflower the same way, added some lemon zest but left out the pre-blanching. 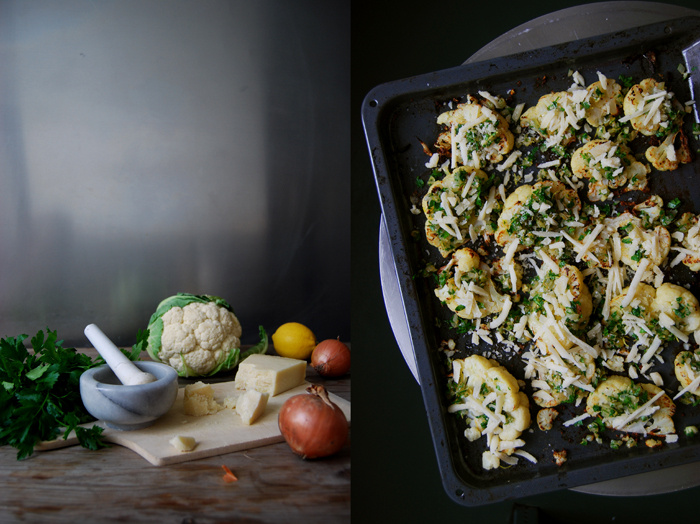 Cut into slim wedges, they only needed 15 minutes to turn into crunchy bites, al dente and with the wonderful aroma of all the roasted flavours. Set the oven to 220°C / 430°F (I used the Rotitherm setting). Heat a splash of olive oil in a pan and cook the onions for a few minutes until golden and soft. Add the garlic and cook for another minute, stir in the lemon zest and parsley and set aside. 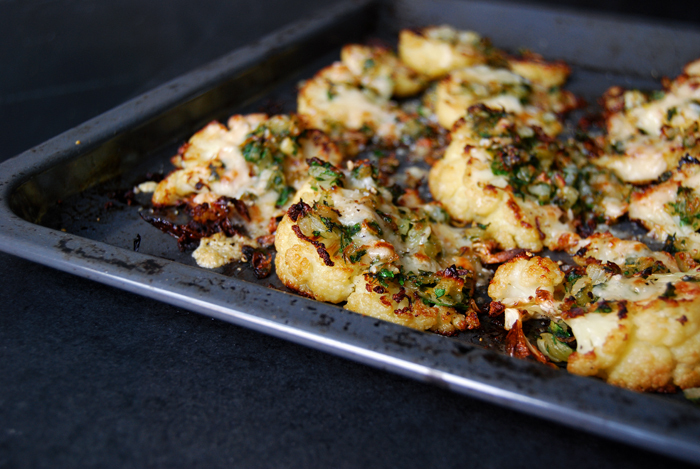 Spread the cauliflower wedges on a baking sheet and coat them with 4 tablespoons of olive oil. Sprinkle with sea salt and pepper and roast in the oven for 10 minutes. Turn the wedges and roast for another 5 minutes. 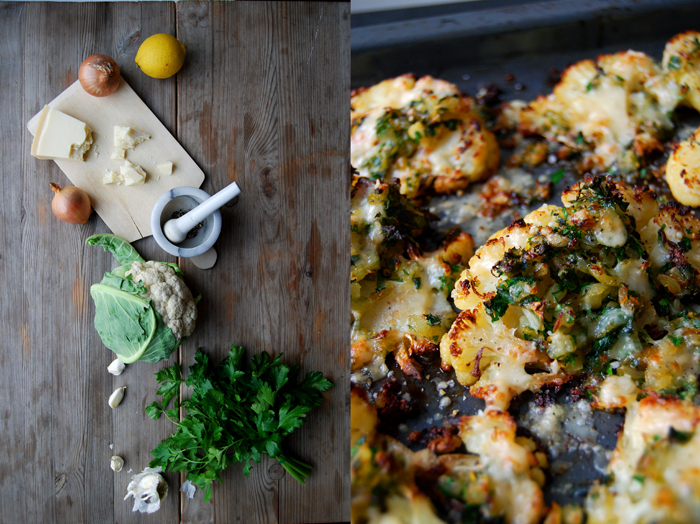 Cover the cauliflower with the onion parsley mixture and sprinkle with parmesan. Bake for 4-5 minutes or until golden brown.